I started hunting halfway through the season last year and unfortunately was unable to fill any of my tags. I did however, set up a bunch of trail cams and managed to get an idea of what type of bucks were roaming around my friend’s property. Among them was a nice typical 8-pointer that showed up two days before Christmas and then vanished after a few days of activity. Given that the season ended shortly after, I spent the spring and summer months fishing and practicing for the 2014 hunting season. I shot arrow after arrow in preparation for my first full season to make sure that shooting would come second nature to me and that hopefully I wouldn’t buckle under the pressure of a monster buck walking towards me. I put the trail cameras out around mid August to get a feel of what type of bucks I had on the property. Had tons of does and a few 4-pointers and 6-pointers that I would have loved to fill a tag with. Every so often I'd get a really nice buck on camera and then he’d disappear. About two weeks before the season I got this gorgeous 8-pointer on camera and realize that he was the deer I had on camera last December. I was so excited to hit the woods just knowing there was a slight possibility of seeing this monster. The season opener comes and I had some really good luck. Saw my first bear up in Roxbury, NY. 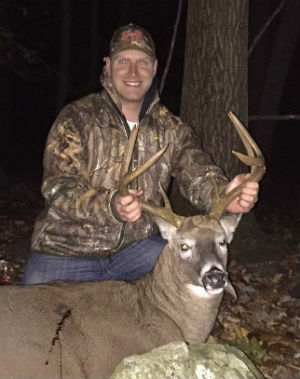 I called in a nice 5-pointer opening weekend, but unfortunately it was close to last shooting light and I just didn’t want to take the chance of making a bad shot, so I let him walk. After opening weekend it was pretty slow for the next three weeks. I sat on extremely warm days and didn’t see a thing and also went tree surfing when the winds were blowing 18 mph with 25 mph gusts ( Cant shoot something from your couch ). I am a bit impatient by nature, so I began to think to myself that I couldn’t be selective at all and would have to take the next decent deer that crossed my path ( if I was lucky enough to be in that situation ). I work a ton so I really have only been able to get out on the weekends and unfortunately, have had some pretty spotty weekend weather. So, Sunday 10/26 cames around and it was blowing about 15 mph with gusts of 20 plus. I was really on the fence about going out and taking another ride in my tree stand, but decided to head in the for the last two hours of the day and see what happens. On the way to the stand I was spraying some doe in Estrous out around a few trees and the cap opened up and leaked all over my hand and pants. Not too happy that I'm going to be standing in the tree stand for the next two hours reeking of doe urine, I climb up in the stand and immediately start swinging back in forth from the blowing wind. After sitting for about twenty minutes on this roller coaster ride, I decided to stand up and mess around with my gloves and readjust a few things. I put my gloves on, went into my bag and got my grunt tube and looked to my left to see this tree swinging back and forth and this monster buck behind it rubbing it like crazy. For the first time in my life I was frozen and didn’t know what to do. The wind was shifting back and forth and started blowing right down in his direction. I thought I was certainly going to get winded and before I knew it, he lifted his head up and started smelling the air. By some saving grace I had spilled the doe estrous on me and by some miracle it masked my scent. He stared right in my direction and started making his way up the hill. He came into about 25 yards and stopped short, staring in my general direction. He knew something was up and looked extremely suspicious, so I knew I only had a few seconds before he took off and may never see him again. The second he turned his head I went full draw and waited for my shot. He took one step forward and I hit him. He jumped about thre feet then slowly kept walking forward. I couldn’t believe that I missed him! He stopped about 15 yards and just stood still looking around wondering what was going on. Before I knew what was happening I somehow managed to knock another arrow and gave him another one. This time he jumped and took off like a bat out of hell. I watched him as long as I could and he turned the corner and ran up this small ridge. I truly couldn’t believe what just happened. Within two minutes my whole season changed. I couldn’t wait a second longer and climbed down from the stand and went looking for my arrows. As it turned out the first shot went right through his gut, causing him to haunch over and walk away slowly. I immediately went toward the second shot area and couldn’t find my arrow. I could only find a small bit of blood and nothing else. I was sick to my stomach. I didn’t know if I hit him good the second time and couldn’t believe I gut shot him. I immediately backed out and started calling my buddies for advice. All of them said to wait till the next morning and then go look for him. I couldn't believe that I just shot my first deer which was the biggest deer I've ever seen in my life…and that it was a gut shot. I couldn’t even eat dinner I was so sick over this. The more I thought about it the more I wanted to go into the woods and find him. So I decided to wait until 11 p.m. ( 7 hours after shooting him ) and go look for the deer. I called two of my buddies and came up with a game plan. Because there was little to no blood, we would have to just go in and sweep the whole area looking for him. We got down in the woods and I told my one friend Jeff where he should start looking. He turned around and lit up his flashlight and BAM!… there is my deer. No more then 5 yards from where I last saw him. The 2nd shot was a lung shot and he didn’t go more then 75 yards before he piled over. 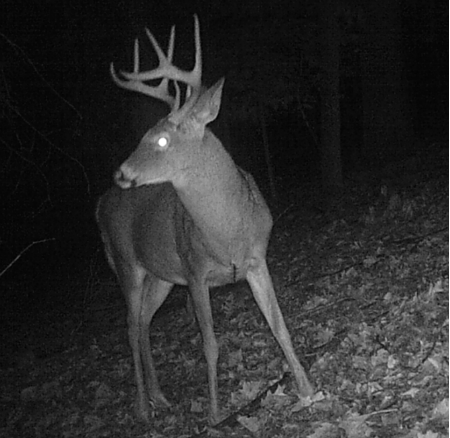 Steve's buck caught on trail cam earlier in the year. I cant even express how excited I was when we found him. I saw pictures of this deer from last year and saw pictures of him from this year and thought of him as a Ghost. That he was just a great buck that lived in the area that I would never get the chance to see. But, on a random Sunday afternoon at 4 p.m. I got lucky and he came walking by my stand. If I never spilled the doe in estrous on myself he almost certainly would have winded me. It was definitely meant to be. The first buck I've ever shot in my life and it may be the buck of a lifetime. I can’t tell you how grateful I am and how much this meant to me. It goes to show you that when you're hunting, anything can happen at any time and all you need is two minutes to change your season around.